I live in Park Slope, Brooklyn; luckily, my house and family were largely unaffected; the kids missed school for a week, many trees are down in Prospect Park, a half block from where we live. But we had no flooding, we never lost power, we suffered no wind damage. But only minutes away in neighborhoods my family and I spend much of our time during the summers – at Coney Island and on the beaches of the Rockaways, and on Staten Island where my daughter attends summer camp (and my son will this coming summer as well), the local communities have been devastated. We shop at the Red Hook Fairway market – usually weekly. Our family often eats there for dinner (they were doing an amazing outdoor barbecue last summer – including with grilled lobster) while doing the weekend shopping. It’s been destroyed by the 12-foot storm surge with 8-foot waves that totally flooded the store. No one knows when or if it will re-open. 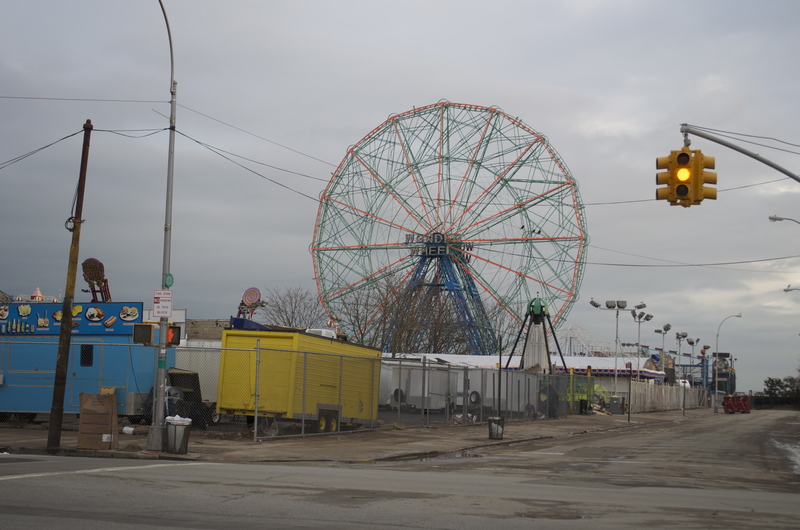 The world famous “Wonder Wheel” on the Coney Island boardwalk. My kids love to ride this in the summertime. Myself, I am terrified of heights. They removed its cars before the storm. Fortunately, the amusement parks did not suffer as much damage here as those on the Jersey shore. It has been heartbreaking to witness such suffering and devastation in New York City. Working on the Rockaways and Coney Island this past week reminded me of some of the most disaster impacted places I have ever visited. The burned out blocks on Breezy Point and downtown Rockaway Beach remind me of the torching of Dili, East Timor, during independence in 1999; the flooding, beach erosion and water damage is slightly reminiscent of, incredibly enough, tsunami damage I witnessed in India and Sri Lanka. The desperation of the underprivileged and homebound stuck in high rise public housing projects without electricity, heat, water or sanitation is eerily akin to conditions in the Houston Astrodome after Hurricane Katrina, but somehow much much worse. Loading relief supplies into my car to bring to St. Gertrude’s Parish on Beach 38th Street in Far Rockaway. My friend Lynn is one of hundreds of volunteers who have been canvassing buildings since the storm, carrying supplies up flights of stairs to the homebound and seeing to their needs. I attended a meeting last evening on the Rockaways to help plan and coordinate building-to-building household assessments that will be conducted by numerous volunteer groups this weekend. While power is slowly being restored to some select locations and there are many generators providing power or lighting where it is needed most, driving trom Breezy Point to the Cross Parkway after dark, it most resembles a war zone; the streets are empty; it is dark by 6 PM; It looks like a ghost town or central Bosnia in 1994. This is New York City two and a half weeks after the storm. Incredible. 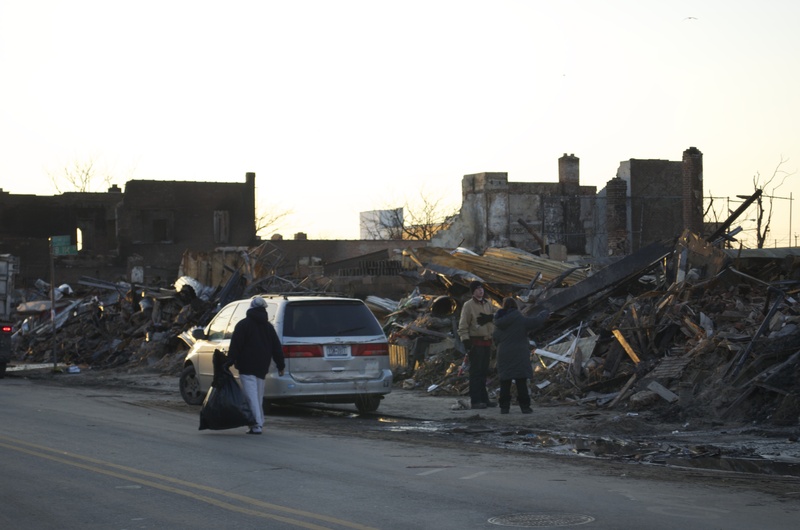 An entire city block in downtown Rockaway Park destroyed by fire. The Yana relief center operated by Occupy Sandy is located just to the right of this photo, at Beach 113th Street and Rockaway Beach Boulevard. While my heart breaks at these deplorable conditions in my city, I am proud that my years of experience in disaster response are being put to good use to help my friends, neighbors, fellow Brooklynites, New Yorkers and Northeasterners. And prouder still that the Sahana Software Foundation has something to offer this response. 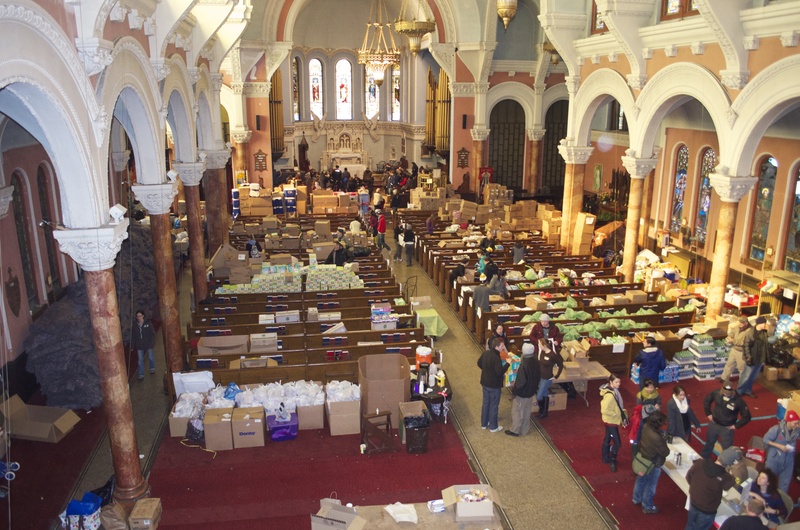 The Church of St Luke and St Matthew at 520 Clinton Avenue in Brooklyn is a hub for much of Occupy Sandy’s relief efforts. The entire church has been turned over to serve as a drop off location for relief items, for volunteer coordination, and as a command center. Sahana software is helping them manage their operations. 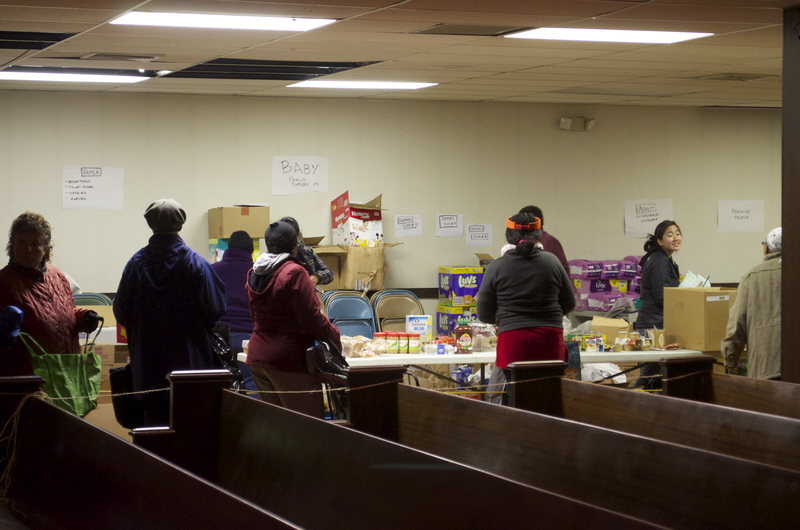 Our current efforts focus on assisting community-based organizations with support and services around the management of mutual aid and assistance to populations affected by Hurricane Sandy in the northeastern United States – particularly in New York City and New Jersey. We have stood up a server (cloud hosted on Amazon EC2) that provides Sahana Eden capabilities customized and configured to the specific needs of disaster response operations for Hurricane Sandy. People’s Relief office in Coney Island using Sahana Eden Sandy Relief site to request volunteers to deliver relief goods to public housing high rise buildings. 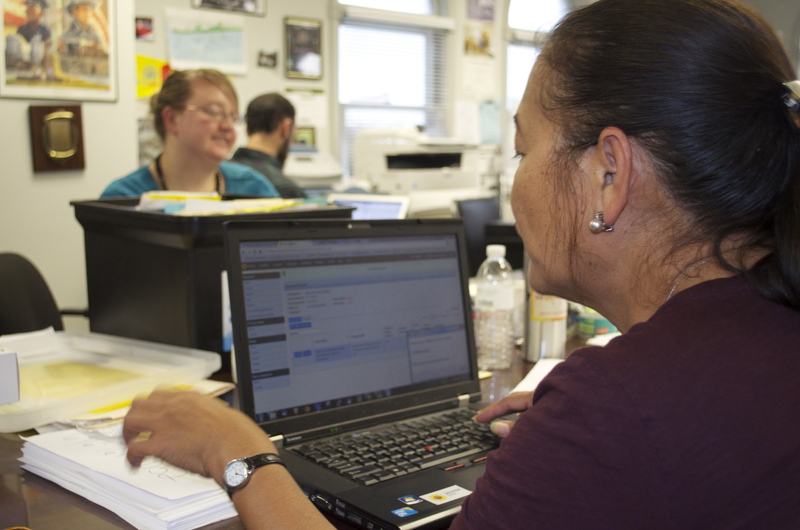 This system has been initially designed to support the collection and aggregation of requests for material assistance and volunteers from the neighborhoods hardest hit by Hurricane Sandy: the Rockaways in Queens, Coney Island and Red Hook in Brooklyn, Staten Island and communities along the New Jersey coast. This will allow organizations, relief drop-off locations and individuals volunteering or donating needed relief items to more effectively prioritize and dispatch needed resources to where they are needed most. The system also provides a means of quickly conducting daily inventories to provide visibility and transparency, and allowing for more efficient and effective distribution of aid – connecting those in need with those who have. 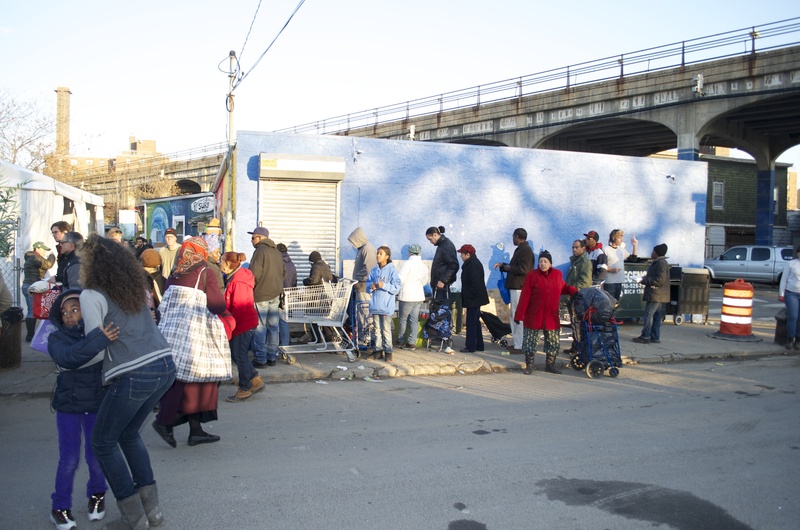 Residents queue at the Rockaway Beach Surf Club on Beach 87th St for distribution of household items, non-perishable food, flashlights, batteries, blankets. Additional feature releases are planned to support volunteer registration and management, aggregation of individual building assessment data, and asset management. This is the third different project to support disaster relief using Sahana products in the region. Earlier, we had put together a volunteer support team for the City’s use of Sahana to register individuals, families and staff at City shelters and stood up a site that uses Sahana Eden’s Hospital Management System to collect information about the location and operating status of hospitals, long-term care and other medical facilities. Much work remains to be done. Fran Boon arrived last night from the UK to assist in coordinating our technical response and support for groups like Occupy Sandy, who now see Sahana Eden as mission critical to their operations. Gotta get back to work. So good to read of your safety and response efforts with Sahana. I remember my first encounter with Sahana in Sri Lanka. It was about a week after it was created. I taught the students at the University of Moratuwa how to use Sahana so they could teach others in the response to the Indian Ocean tsunami. Sahana is a great application, especially for coordinating volunteers and donations. It’s great to hear from you. Your dedication and service in Sri Lanka has not been forgotten. Thanks for being a part of helping Sahana get its start. I’m at the Hurricane Hackers hackathon with Fran, Occupy and a bunch of other people who’ve taken time out from delivering food and clearing debris, to help specify the technology needed to support their efforts. It’s pretty humbling to hear their stories, and Sahana is turning up in a lot of their conversations… thank you so much for everything you’ve done to make it a useful tool… and hopefully the hackathon will help give it some more capabilities.